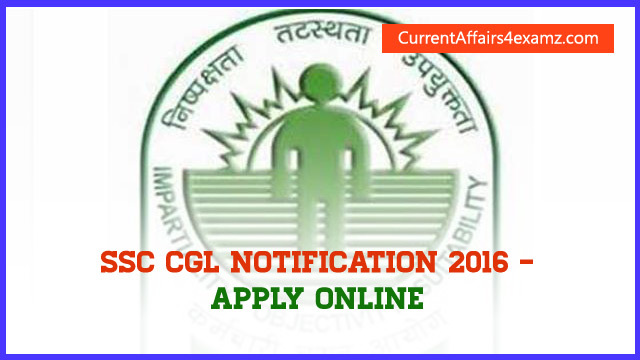 Staff Selection Commission has notified the Combined Graduate Level Examination 2016 - SSC CGL 2016. Staff Selection Commission will hold the Combined Graduate Level Examination, 2016 (Tier-I) on SUNDAY the 8th & 22nd May, 2016. 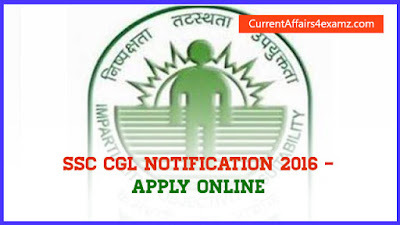 SSC CGL 2016 is for filling up different categories of posts in various Ministries/ Departments/Organizations. 1) Assistant Audit Officer: Bachelor’s Degree from a recognized University or Institute. 2) Desirable Qualifications for the Post of Assistant Audit Officer: Chartered Accountant or cost & Management Accountant or Company Secretary or Masters in Commerce or Masters in Business Studies or Masters in Business Administration (Finance) or Masters in Business Economics. 3) Statistical Investigator Grade – II Bachelor’s Degree in any subject from a recognized University or Institute with at least 60% in Mathematics at 12th standard level or Bachelor’s Degree in any subject with Statistics as one of the subjects at degree level. 4) Compiler : Bachelor’s Degree from any recognized University with Economics or Statistics or Mathematics as compulsory or Elective subject. 5) All other Posts: Bachelor’s Degree from a recognized University or equivalent. Age Limit (as on 1st August, 2016): Age limit is different for each post. Please refer the official notification from below link for more details about age limit. Tier -III- Computer Proficiency Test/ Skill Test (wherever applicable)/Document Verification. Interview component has been dispensed with. There will, therefore, be no interview. All Women candidates and candidates belonging to Scheduled Caste, Scheduled Tribe, Physically Handicapped, and Ex-Servicemen eligible for reservation are exempted from paying application fee, as per extant government orders. -- The candidates who are not exempted from paying examination fee may submit the requisite fee through State Bank of India only either in the form of challan, generated on line, or through SBI Net Banking. Payment can also be made through any Credit or Debit Card. How to Apply: The application must be submitted through online mode only. We will bring you more details regarding SSC CGL 2016 like Exam Pattern, New Changes, Syllabus of Exam, Useful Books etc. in coming days. So Keep visiting.